In February ESN VMU started new project called “Try Tropical with ESN VMU”- weekly trips to the Botanical Garden with our international students. Since we are all eagerly waiting for summer why not escape into tropical weather with rainforest plants and exotic animals? Especially when it’s not that far from university, just a few bus stops away. The garden which was built in 1923 has always been known as Vytautas Magnus University Botanical garden. It has few ponds, a greenhouse, an old manor and hundreds of different plants and trees. First we are going to the greenhouse. Primary thing you notice there is the temperature change. It’s so warm and tropical that you don’t need your coat anymore. Right after that you spot a very friendly and huge iguana seeking for your attention. Just open his cage and stroke him, he appreciates that more than one can expect. Moving on we are entering into the forest with huge palm trees, Koi fishes, turtles and blooming flowers. Most of the plants here are grown up from the seeds, because this botanical garden takes part in seeds exchange program with other gardens in Europe. Nevertheless, you can also see a 150-years-old plant which was transported to the greenhouse from elsewhere. Later on as you are entering the cactuses room you will smell rotten food or garbage. It means that Death flowers are blooming. This predator plant starts blooming in early spring and its smell of a rotten meat attracts insects. Even its blossom is bloody red and wrinkly. Besides that you’ll see a variety of huge cactuses. Our second attraction is the Mini Zoo which is located in the old manor. It was built in 1807 by a noble man named Josef Godlevsky who bought the park and few villages. Rumor has it that this building is haunted. So watch out for the ghosts and don’t get scared! Mini zoo has all kinds of reptiles, insects, gorgeous fishes and small animals. If you are not afraid you can hold, pet and even feed friendly lizards. Or just stay still and let the milk snake crawl all over your shoulders and hands. Maybe you are the brave one to discover the world of insects? Few kinds of cockroaches, crickets, sticks and other breeds are waiting to be interacted. You can also admire huge spiders, or watch how the aggressive Cayman turtles eat their food. “Try tropical” excursions are very fun, warm but a bit challenging. So if you want to discover more about Kaunas and nature you are welcome to join us every Friday around 14:30 – 15:30 at Baltija Dorm. 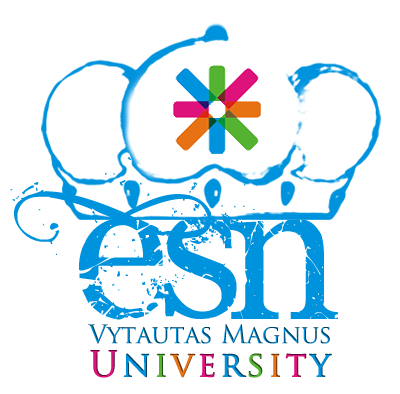 Think different, think ESN VMU!